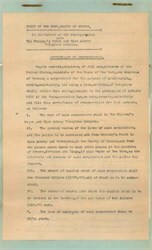 Document from the State of New York issued in 1904 for the Incorporation of Whitney's Point and Glen Aubrey Telephone Company. This three page document has all of the officers names and legal verbage. This historic document is hand signed by the Second Deputy Secretary of State and is over 98 years old.